The new "30 Years War"
A 30-year war for energy preeminence? You wouldn’t wish it even on a desperate planet. But that’s where we’re headed and there’s no turning back. From 1618 to 1648, Europe was engulfed in a series of intensely brutal conflicts known collectively as the Thirty Years’ War. It was, in part, a struggle between an imperial system of governance and the emerging nation-state. Indeed, many historians believe that the modern international system of nation-states was crystallized in the Treaty of Westphalia of 1648, which finally ended the fighting. Think of us today as embarking on a new Thirty Years’ War. It may not result in as much bloodshed as that of the 1600s, though bloodshed there will be, but it will prove no less momentous for the future of the planet. Over the coming decades, we will be embroiled at a global level in a succeed-or-perish contest among the major forms of energy, the corporations which supply them, and the countries that run on them. The question will be: Which will dominate the world’s energy supply in the second half of the twenty-first century? The winners will determine how -- and how badly -- we live, work, and play in those not-so-distant decades, and will profit enormously as a result. The losers will be cast aside and dismembered. Why 30 years? Because that’s how long it will take for experimental energy systems like hydrogen power, cellulosic ethanol, wave power, algae fuel, and advanced nuclear reactors to make it from the laboratory to full-scale industrial development. Some of these systems (as well, undoubtedly, as others not yet on our radar screens) will survive the winnowing process. Some will not. And there is little way to predict how it will go at this stage in the game. At the same time, the use of existing fuels like oil and coal, which spew carbon dioxide into the atmosphere, is likely to plummet, thanks both to diminished supplies and rising concerns over the growing dangers of carbon emissions. This will be a war because the future profitability, or even survival, of many of the world’s most powerful and wealthy corporations will be at risk, and because every nation has a potentially life-or-death stake in the contest. For giant oil companies like BP, Chevron, ExxonMobil, and Royal Dutch Shell, an eventual shift away from petroleum will have massive economic consequences. They will be forced to adopt new economic models and attempt to corner new markets, based on the production of alternative energy products, or risk collapse or absorption by more powerful competitors. In these same decades, new companies will arise, some undoubtedly coming to rival the oil giants in wealth and importance. The fate of nations, too, will be at stake as they place their bets on competing technologies, cling to their existing energy patterns, or compete for global energy sources, markets, and reserves. Because the acquisition of adequate supplies of energy is as basic a matter of national security as can be imagined, struggles over vital resources -- oil and natural gas now, perhaps lithium or nickel (for electric-powered vehicles) in the future -- will trigger armed violence. When these three decades are over, as with the Treaty of Westphalia, the planet is likely to have in place the foundations of a new system for organizing itself -- this time around energy needs. In the meantime, the struggle for energy resources is guaranteed to grow ever more intense for a simple reason: there is no way the existing energy system can satisfy the world’s future requirements. It must be replaced or supplemented in a major way by a renewable alternative system or, forget Westphalia, the planet will be subject to environmental disaster of a sort hard to imagine today. To appreciate the nature of our predicament, begin with a quick look at the world’s existing energy portfolio. According to BP, the world consumed 13.2 billion tons of oil-equivalent from all sources in 2010: 33.6% from oil, 29.6% from coal, 23.8% from natural gas, 6.5% from hydroelectricity, 5.2% from nuclear energy, and a mere 1.3% percent from all renewable forms of energy. Together, fossil fuels -- oil, coal, and gas -- supplied 10.4 billion tons, or 87% of the total. Even attempting to preserve this level of energy output in 30 years’ time, using the same proportion of fuels, would be a near-hopeless feat. Achieving a 40% increase in energy output, as most analysts believe will be needed to satisfy the existing requirements of older industrial powers and rising demand in China and other rapidly developing nations, is simply impossible. Two barriers stand in the way of preserving the existing energy profile: eventual oil scarcity and global climate change. Most energy analysts expect conventional oil output -- that is, liquid oil derived from fields on land and in shallow coastal waters -- to reach a production peak in the next few years and then begin an irreversible decline. Some additional fuel will be provided in the form of “unconventional” oil -- that is, liquids derived from the costly, hazardous, and ecologically unsafe extraction processes involved in producing tar sands, shale oil, and deep-offshore oil -- but this will only postpone the contraction in petroleum availability, not avert it. By 2041, oil will be far less abundant than it is today and so incapable of meeting anywhere near 33.6% of the world’s (much expanded) energy needs. Meanwhile, the accelerating pace of climate change will produce ever more damage -- intense storm activity, rising sea levels, prolonged droughts, lethal heat waves, massive forest fires, and so on -- finally forcing reluctant politicians to take remedial action. This will undoubtedly include an imposition of curbs on the release via fossil fuels of carbon dioxide and other greenhouse gases, whether in the form of carbon taxes, cap-and-trade plans, emissions limits, or other restrictive systems as yet not imagined. By 2041, these increasingly restrictive curbs will help ensure that fossil fuels will not be supplying anywhere near 87% of world energy. If oil and coal are destined to fall from their position as the world’s paramount source of energy, what will replace them? Here are some of the leading contenders. Natural gas: Many energy experts and political leaders view natural gas as a “transitional” fossil fuel because it releases less carbon dioxide and other greenhouse gases than oil and coal. In addition, global supplies of natural gas are far greater than previously believed, thanks to new technologies -- notably horizontal drilling and the controversial procedure of hydraulic fracturing (“fracking”) -- that allow for the exploitation of shale gas reserves once considered inaccessible. For example, in 2011, the U.S. Department of Energy (DoE) predicted that, by 2035, gas would far outpace coal as a source of American energy, though oil would still outpace them both. Some now speak of a “natural gas revolution” that will see it overtake oil as the world’s number one fuel, at least for a time. But fracking poses a threat to the safety of drinking water and so may arouse widespread opposition, while the economics of shale gas may, in the end, prove less attractive than currently assumed. In fact, many experts now believe that the prospects for shale gas have been oversold, and that stepped-up investment will result in ever-diminishing returns. Nuclear power: Prior to the March 11th earthquake/tsunami disaster and a series of core meltdowns at the Fukushima Daiichi nuclear power complex in Japan, many analysts were speaking of a nuclear "renaissance," which would see the construction of hundreds of new nuclear reactors over the next few decades. Although some of these plants in China and elsewhere are likely to be built, plans for others -- in Italy and Switzerland, for example -- already appear to have been scrapped. Despite repeated assurances that U.S. reactors are completely safe, evidence is regularly emerging of safety risks at many of these facilities. Given rising public concern over the risk of catastrophic accident, it is unlikely that nuclear power will be one of the big winners in 2041. However, nuclear enthusiasts (including President Obama) are championing the manufacture of small “modular” reactors that, according to their boosters, could be built for far less than current ones and would produce significantly lower levels of radioactive waste. Although the technology for, and safety of, such “assembly-line” reactors has yet to be demonstrated, advocates claim that they would provide an attractive alternative to both large conventional reactors with their piles of nuclear waste and coal-fired power plants that emit so much carbon dioxide. Wind and solar: Make no mistake, the world will rely on wind and solar power for a greater proportion of its energy 30 years from now. According to the International Energy Agency, those energy sources will go from approximately 1% of total world energy consumption in 2008 to a projected 4% in 2035. But given the crisis at hand and the hopes that exist for wind and solar, this would prove small potatoes indeed. For these two alternative energy sources to claim a significantly larger share of the energy pie, as so many climate-change activists desire, real breakthroughs will be necessary, including major improvements in the design of wind turbines and solar collectors, improved energy storage (so that power collected during sunny or windy periods can be better used at night or in calm weather), and a far more efficient and expansive electrical grid (so that energy from areas favored by sun and wind can be effectively distributed elsewhere). China, Germany, and Spain have been making the sorts of investments in wind and solar energy that might give them an advantage in the new Thirty Years’ War -- but only if the technological breakthroughs actually come. Biofuels and algae: Many experts see a promising future for biofuels, especially as “first generation” ethanol, based largely on the fermentation of corn and sugar cane, is replaced by second- and third-generation fuels derived from plant cellulose (“cellulosic ethanol”) and bio-engineered algae. Aside from the fact that the fermentation process requires heat (and so consumes energy even while releasing it), many policymakers object to the use of food crops to supply raw materials for a motor fuel at a time of rising food prices. However, several promising technologies to produce ethanol by chemical means from the cellulose in non-food crops are now being tested, and one or more of these techniques may well survive the transition to full-scale commercial production. At the same time, a number of companies, including ExxonMobil, are exploring the development of new breeds of algae that reproduce swiftly and can be converted into biofuels. (The U.S. Department of Defense is also investing in some of these experimental methods with an eye toward transforming the American military, a great fossil-fuel guzzler, into a far “greener” outfit.) Again, however, it is too early to know which (if any) biofuel endeavors will pan out. Hydrogen: A decade ago, many experts were talking about hydrogen’s immense promise as a source of energy. Hydrogen is abundant in many natural substances (including water and natural gas) and produces no carbon emissions when consumed. However, it does not exist by itself in the natural world and so must be extracted from other substances -- a process that requires significant amounts of energy in its own right, and so is not, as yet, particularly efficient. Methods for transporting, storing, and consuming hydrogen on a large scale have also proved harder to develop than once imagined. Considerable research is being devoted to each of these problems, and breakthroughs certainly could occur in the decades to come. At present, however, it appears unlikely that hydrogen will prove a major source of energy in 2041. X the Unknown: Many other sources of energy are being tested by scientists and engineers at universities and corporate laboratories worldwide. Some are even being evaluated on a larger scale in pilot projects of various sorts. Among the most promising of these are geothermal energy, wave energy, and tidal energy. Each taps into immense natural forces and so, if the necessary breakthroughs were to occur, would have the advantage of being infinitely exploitable, with little risk of producing greenhouse gases. However, with the exception of geothermal, the necessary technologies are still at an early stage of development. How long it may take to harvest them is anybody’s guess. Geothermal energy does show considerable promise, but has run into problems, given the need to tap it by drilling deep into the earth, in some cases triggering small earthquakes. From time to time, I hear of even less familiar prospects for energy production that possess at least some hint of promise. At present, none appears likely to play a significant role in 2041, but no one should underestimate humanity’s technological and innovative powers. As with all history, surprise can play a major role in energy history, too. Energy efficiency: Given the lack of an obvious winner among competing transitional or alternative energy sources, one crucial approach to energy consumption in 2041 will surely be efficiency at levels unimaginable today: the ability to achieve maximum economic output for minimum energy input. The lead players three decades from now may be the countries and corporations that have mastered the art of producing the most with the least. Innovations in transportation, building and product design, heating and cooling, and production techniques will all play a role in creating an energy-efficient world. Thirty years from now, for better or worse, the world will be a far different place: hotter, stormier, and with less land (given the loss of shoreline and low-lying areas to rising sea levels). Strict limitations on carbon emissions will certainly be universally enforced and the consumption of fossil fuels, except under controlled circumstances, actively discouraged. Oil will still be available to those who can afford it, but will no longer be the world’s paramount fuel. New powers, corporate and otherwise, in new combinations will have risen with a new energy universe. No one can know, of course, what our version of the Treaty of Westphalia will look like or who will be the winners and losers on this planet. In the intervening 30 years, however, that much violence and suffering will have ensued goes without question. Nor can anyone say today which of the contending forms of energy will prove dominant in 2041 and beyond. Were I to wager a guess, I might place my bet on energy systems that were decentralized, easy to make and install, and required relatively modest levels of up-front investment. For an analogy, think of the laptop computer of 2011 versus the giant mainframes of the 1960s and 1970s. The closer that an energy supplier gets to the laptop model (or so I suspect), the more success will follow. From this perspective, giant nuclear reactors and coal-fired plants are, in the long run, less likely to thrive, except in places like China where authoritarian governments still call the shots. Far more promising, once the necessary breakthroughs come, will be renewable sources of energy and advanced biofuels that can be produced on a smaller scale with less up-front investment, and so possibly incorporated into daily life even at a community or neighborhood level. Whichever countries move most swiftly to embrace these or similar energy possibilities will be the likeliest to emerge in 2041 with vibrant economies -- and given the state of the planet, if luck holds, just in the nick of time. Bio: Michael T. Klare is a professor of peace and world security studies at Hampshire College, a TomDispatch regular, and the author, most recently, of Rising Powers, Shrinking Planet. 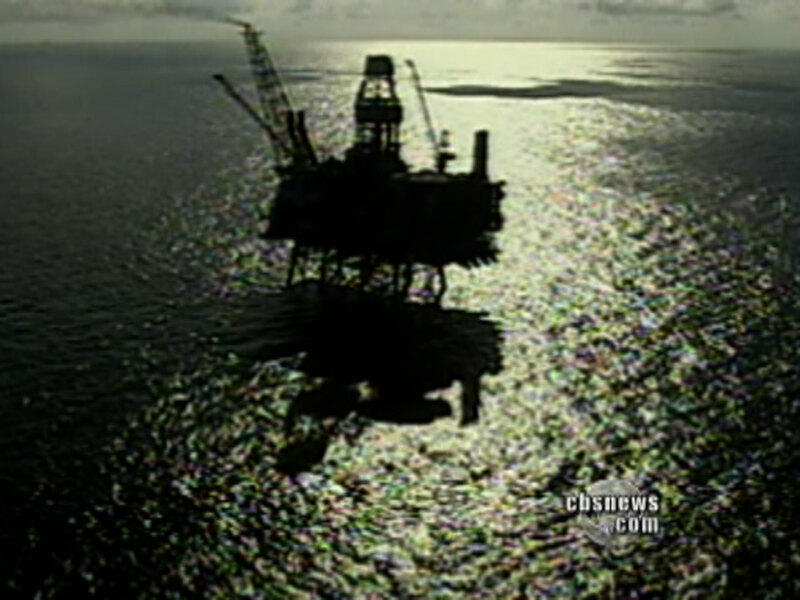 A documentary movie version of his previous book, Blood and Oil, is available from the Media Education Foundation. This piece originally appeared on TomDispatch. The opinions expressed in this commentary are solely those of the author. The president is suing one of the most powerful Democrats in Congress. Kevin Cirilli, chief Washington correspondent for Bloomberg News, joins CBSN's "Red & Blue" to discuss the lawsuit.